This picture was submitted by Doug and Shirley Lindsey of Sacramento. Shirley was visiting friends who live along the American River near Sacramento. 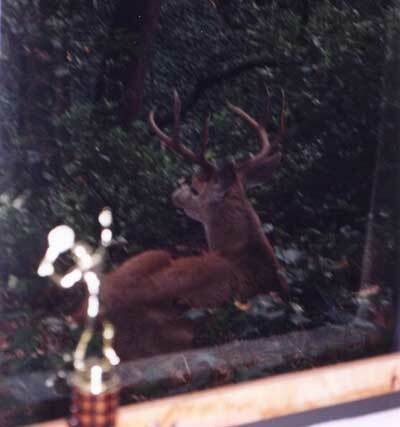 They showed Shirley the buck which was just outside their window (notice tennis trophy on inside window ledge). They told Shirley the buck came everyday and bedded down in the shrubs just out side their window. Wouldn't you rather have a lawn ornament like this than one of those fake ceramic deer?